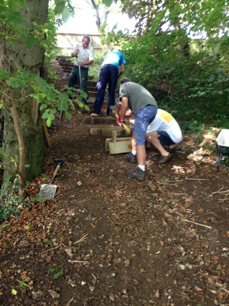 At our last workday on Saturday 20th September 2014 we carried out some more repair work on the long flight of steps from the top path to the middle path. The steps are located by the upper twitten leading to Woodland Avenue. Under the excellent guidance of our Park Ranger we dug out the broken steps and replaced the stays with new oak posts (in keeping with the natural surroundings). We also added a new step at the bottom. This project will make the steps safer to use in the winter months when the area can be more slippery. The team also continued with some clearance work at the top of the Copse and our general litter picking duties! Unfortunately the Copse has suffered with 'fly-tipping' where a few people have been using the Copse as a dumping ground for Green Waste. Our Ranger has attached a number of notices about 'anti-fly-tipping' and 'anti-graffiti' so there is a clear visual reminder of the problem, and it is hoped this will stop any future incidents. At our next workday we will include inspecting the stakes supporting the new Silver Birch trees and adjusted if necessary. Some seem too loose in the ground, whilst others have ties too tight after growing in the summer sun. Future Projects include erecting Information Boards, with a separate sub-committee looking into the design and location of the boards. If you would like to join our friendly team please do come along to our next Workday on Saturday 22nd Nov 2014 10.00am until 1.00pm (stay as long as you like). We always meet at the bench near the Silver Birch Trees at the bottom of the green slope. Come along and join in the fun.